Lt.-Gen. Courtney H. Hodges' 1st Army crosses into Belgium. Outfits of 1st Infantry Division (U.S.) and 3rd Armored Division (U.S.) reach the western border of Germany at Roetgen, south of Aachen. 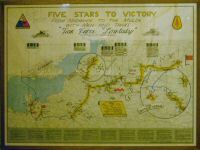 U.S. 3rd Armored Combat Command B Task Force Lovelady, under the command of Lt. Col. William B. Lovelady, is the first Allied force to enter the area known as the "Huertgen Forest". The first breach of the Siegfried Line north of Roetgen. 9th Division 47th Infantry is covering the right flank of 3rd Armored units and penetrates the Huertgen Forest through its center. After two days of endless fighting against the German 74th Corp, made up from two beat-up infantry divisions and its concealed fortifications, the 47th manages to emerge from the forest and takes the town of Schevenhütte without much of a struggle. LONDON, Sept. 15 (CP). — The United states 1st Army smashed the Siegfried Line at its strongest point east of the German gateway bastion of Aachen today and drove along the last 30 miles toward the great industrial city of Cologne and the Rhine. Climaxing an assault that began Thursday, American infantry battered through the main belt of pillboxes and dragon-teeth concrete tank barriers on which Hitler relied to keep invaders from his source of military strength in the Rhineland. American troops in Germany are well through the Siegfried Line on an 18-mile front east and southeast of Aachen. The first heavy German counter-attack since Lt.-Gen. Courtney Hodges penetrated the line was broken there Saturday and early Sunday, but there is still some fighting around Stolberg. The advance through the Roetgen Forest southeast of Aachen is continuing. The enemy admits the loss, of some fortified positions in this area. The 3rd Armored Division (U.S) and the 9th Infantry Division (U.S) move into the forest. Sept. 20, 1944: The Americans reach the valley of the Weisser Wehe and the northwestern edge of Todtenbruch (Deadman's Moor), and with it the border of the municipality Hürtgenwald. The attack of the 9th I.D. fails because of intensifying resistance and excessive underestimation of the area. For the first time Americans must lead a fight in dense forest woods. Tank and half-track vehicles advance only slowly. East Aachen fighting is in progress in the factory area of Stolberg and enemy pressure is being met near Buesbach. Operating in advance of our ground forces, medium and light bombers hit railway yards at Eschweiler, Dueren and Merzenich, on the Aachen-Cologne line. Mopping up of enemy pillboxes and pockets of resistance continues east of Roetgen and in the Hoefen and Alzen areas, south of Monschau. Enemy counter-attacks in this area were unsuccessful. The New York Times, Thursday , September 21, 1944. Allied troops are clearing the Huertgen Forest against moderate artillery fire and are also mopping up in the area of Lammersdorf. The New York Times, Thursday , September 23, 1944. Our forces have captured Stolberg, east of Aachen and now are mopping up isolated enemy pockets in the town. South of Stolberg we inflicted heavy losses in repulsing German counter-attacks. Stubborn resistance was met from enemy pillboxes and defended road blocks. The New York Times, Thursday , September 24, 1944. Attack of the 9th I.D. in the Wehebach valley towards Germeter. The attacking American infantry suffers dreadful losses by treebursts. The Germans are protected in their field positions and fortifications. In the forest fight, it is difficult to find targets for the US artillery and US Air Force. In a second thrust toward the Cologne plain, American 1st Army infantry has pushed nearly one mile more through the Hurtgen Forest 20 miles east of Aachen to within six miles of the communications centre of Duren, midway between the German border and Cologne. German resistance is stiff and progress slow, prompting Hodges to begin the reduction of Aachen before the encirclement was complete. A surrender ultimatum delivered to the German garrison in Aachen on 10 October brings no response: Hitler has designated Aachen as a "fortress", meaning it must be hold to the last man. The U.S. Infantry reach Germeter; Front: today's road # B399. Good progress in the Forest of Huertgen has taken our troops to within less than two miles of the village of Huertgen. The New York Times, Monday, October 9, 1944. Attack towards the city of Aachen. The U.S. 1st Inf. Div calls for the surrender of Aachen within 24 hours. In the Hurtgen Forest, counterattacking German units overrun the two forward platoons of the 39th Inf., 9th Inf. Div. American units retake the lost ground later in the day, and take the city of Germeter without opposition. Southeast of Aachen, 1st Army forces fighting through the gloomy Hurtgen Forest were within two miles of the town of that name and were engaged in heavy fighting six miles from Duren, 20 miles from Cologne. Throughout the Aachen sector we are encountering considerable enemy artillery, small arms and machine-gun fire. Southwest of Huertgen we have renewed our advance in rugged terrain meeting stubborn opposition from German field defenses. An enemy counter-attack was repulsed. The New York Times, Tuesday, October 10, 1944. Hard fighting is in progress southwest of Huertgen and our troops have made gains. Patrol activity and sporadic artillery fire are reported along the frontier in the area of Monschau. The New York Times, Thursday, October 12, 1944. Southeast of Aachen our troops have advanced against stubborn resistance to cut the Monschau-Dueren road about one mile southwest of Huertgen. The New York Times, Friday, October 13, 1944. Four miles east of Stolberg our forces have advanced slightly against heavy resistance. Farther south in the Huertgen sector we reached Vossenack, but were pushed back slightly by a counterattack. The New York Times, Saturday, October 14, 1944. In Huertgen forest, near Germeter, we are making slow progress against stiff opposition to regain ground lost earlier in a strong enemy counterattack. Two miles southwest of Germeter slight advances have been made and pillboxes are being mopped up. The New York Times, Sunday, October 15, 1944. The unshaven, wet, miserable and battle-weary infantrymen of the 9th Infantry Division are relieved by the 28th Infantry Division. A succession of American infantry divisions, the 9th, the 28th, and then the 4th would each suffer losses equivalent to a regiment in that hated patch of forest. The surrender of Aachen. Colonel Gerhard Wilck order his men to stop fighting. "All Souls Day battle around Vossenack"
On November 2, the 28th Infantry Division takes up the fight. When the 28th try to move forward, it's like walking into hell. From their bunkers, the Germans send forth a hail of machine-gun and rifle fire and mortars. The GI's are caught in thick minefields. The division send down orders to move tanks down a track called the Kall trail and to capture the key town of Schmidt, which controls the road network. The first American troops to descend the trail are two battalions of the 112th Infantry, early on November 3. Marching down in column from Vossenack and up the other slope, they successfully — and to everyone’s surprise — reach first Kommerscheidt and then Schmidt. The United States 1st Army assault, carrying through the easternmost fringes of Hurtgen forest, also swept up the village of Germeter, just to the north of Vossenack, a front despatch said. There was no counter-fire from German batteries, for the American guns that blasted a path for the infantry were so well hidden the enemy could not tell from which direction the shells were coming. Fighter-bombers, unable to provide close support in the dense woods, ranged ahead, smashing 100 freight cars. More than 250 prisoners were taken, and the drive was moving ahead against stiffening resistance. Nov. 4, 1944: Simonskall is occupied by units of the 110th Infantry. Engineers of the 20th Engineer Combat Battalion were assigned to develop a trail in the Kall River gorge, Huertgen Forest area, Germany, into a main supply road. The Germans launched an attack that drove the infantry back in disorder. The 146th Engineer Combat Battalion rushed into Vossenack, and the 1340th and Company A, 20th Engineer Combat Battalion, were committed as infantry to hold the Kall River bridge. The engineers drove off the enemy and secured the bridge during a week-long battle. At dawn on the 4th, the combined force of Panzer-Regiment 16 (Oberst Johannes Bayer) and Infanterie-Regiment 1055 struck at Schmidt from both north and south-west. Unable to stop the armor firing point-blank into houses and foxholes, the American battalion brakes. Further American progress in the Duren area, duplicating the first day surprise advance of two miles, lessens the possibility that the Hurtgen Forest attack was merely probing to test enemy strength or local improvement of position. A four-mile deep dent in the German front of unindicated width has stabbed to higher ground overlooking the upper stretches of the Roer River. It was driven home against stubborn enemy resistance and without benefit of close air support due to adverse weather. That implies massed guns to back the drive as well as considerable infantry forces engaged. It tends to illustrate, also, the thinness of German defenses between fortified stone built towns and cities that form the anchorages of the Nazi front. Our troops, attacking the Huertgen sector after heavy artillery preparation, made gains of 2,500 yards. The town of Vossenack, one and a half miles south of Huertgen, was taken and our drive is continuing against stiffening resistance. The New York Times, Saturday, November 4, 1944. Southeast of Aachen, fighter-bombers, in close support of our ground forces, attacked enemy units and tanks. Our forces made small gains south of Vossenack against moderate to heavy resistance and have entered the town of Schmidt, two miles to the south-west. In the forest south of Vossenack we are clearing out pillboxes against stubborn opposition. The New York Times, Sunday, November 5, 1944. On November 6, the 4th Infantry Division reach the Huertgen Forest, where a severe engagement will take place until early December. Americans driven out. of Schmidt, southeast of Aachen, Saturday struck back with the reinforcing weight of tanks and mobile artillery. They repulsed new German counterblows and made limited advances against strong resistance. Air forces teamed with the ground troops, hurling bombs on already-rubbled Schmidt and then strafing the Germans holding the town. Pilots claimed destruction of 10 enemy armored vehicles, and estimated 12 to 15 German tanks were damaged. Northwest of Schmidt, the Americans inched ahead against Germans stubbornly determined to prevent an advance to the Roer River, one of the last barriers before Cologne. Minefields and artillery barrages slowed progress. Near Germeter, infantrymen encircled one small but strongly entrenched German force. Globe and Mail Nov, 6 1944. German counter-attacks retook Vossenack in the Huertgen forest today and, although the doughboys regained about half the town by nightfall, this local offensive has been definitely checked. The Germans are well aware that the American advance through the Huertgen Forest would put the 1st Army in an advantageous position menacing Duren and the entire German position along the Roer River. They are fighting hard and counter-attacking repeatedly, and it must be admitted, meeting with some success. An enemy counter-attack in the vicinity of Schmidt, from which we bad been forced to withdraw, was repulsed yesterday afternoon, and our troops are again making progress toward Schmidt. Pillboxes are being mopped up in the area west and northwest of the town, which was dive-bombed and strafed by our fighter-bombers yesterday. In the area of Huertgen we continue to make slow progress against mines, infantry and artillery. Less than a mile to the southeast our advance is meeting strong resistance from tanks and infantry. East of Aachen medium and light bombers attacking in waves bombed enemy strong points at Eschweiler. 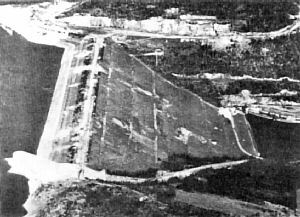 Fighters and fighter-bombers went for rail yards at Dueren, Hamm and Bruhl. The New York Times, Monday, November 6, 1944. Late on the 7th, General Hodges of the First Army approve the withdrawal of all troops from beyond the Kall. Another day, November 8, is needed for Task Force Davis to attempt to secure the western slope of the gorge. Our forces made small gains in the Huertgen forest sector against stubborn resistance. Extensive minefields covered by artillery and small arms fire hindered our progress southwest of the town of Huertgen, and our units near Kommerscheidt, three-quarters of a mile northwest of Schmidt, continued to meet strong pressure of tank, infantry and artillery fire. Mopping-up continued in the forest approximately one mile west of Schmidt. Our fighter-bombers attacked tanks and troops near Schmidt. The New York Times, Tuesday, November 7, 1944. A front despatch tonight described the fight for Vossenack as "savage as was the struggle for Aachen, — and one of much greater scope." It said that fighting of "unexcelled bitterness" was raging continuously over all the Hurtgen Forest region. The Town of Schmidt, which the Germans recaptured in a counter-attack two days ago, still was in enemy hands. Despite the house-to-house character of the fighting inside Vossenack, American artillery was blasting away at German positions in the upper part of the town and fighter-bombers were pinpointing targets along the main street. Special dynamite units were being used to blow up enemy pillboxes. "In the Schmidt area alone there are up to 50 German tanks," said Associated Press Correspondent William S. White. "The enemy is holding on all over this front, which covers the approaches to Duren and to Cologne itself, as he has rarely held on to any local area in this campaign." Globe and Mail Nov, 8 1944. Our units continued to meet strong opposition in the Huertgen Forest. A. German counter-attack was repulsed west of Huertgen but a thrust by enemy infantry and tanks in Vossenack forced us to withdraw a short distance to the town. The enemy attack was contained and our unite resumed the offensive to regain their former positions. We made small gains two miles west of Schmidt against heavy opposition. Fighter-bombers, supporting our ground units in the Schmidt area, made a aeries of attacks on enemy troops and armored units. They also bombed and strafed military buildings northeast of Gelsenkirchen and hit targets at Juelich, and fuel and ammunition dumps at Dueren. The New York Times, Wednesday, November 8, 1944. A front despatch from William S. White of The Associated Press said the Hurtgen attack had “run down,” with loss of most of the ground gained in its early phases. Kommerscheidt, a village between Vossenack and Schmidt, was lost Wednesday and American infantry was driven back 500 yards to high ground to the northwest. “ But considerable progress has been made in clearing Hurtgen Forest, and the Germans suffered severe casualties, especially to our superior artillery,” White said. Vossenack still was the scene of heavy house-to-house fighting, with each side holding approximately half the town. Globe and Mail Nov, 9 1944. The U.S. 1st Army lashed out in limited attacks southeast of Aachen. The communique reported small gains in the face of heavy enemy pressure south of Vossenack, 13 miles southeast of Aachen, and said Germans still were being cleared from Hurtgen Forest west of Schmidt, two miles further south. The Berlin radio declared an all-out offensive was in preparation on this front. It said the Americans used smoke screens and began a heavy artillery barrage north of Aachen. Globe and Mail Nov, 10 1944. In the Huertgen Forest sector our forces are attacking against strong enemy pressure and are gaining ground slowly in the area south of Vossenack. Gains have been made against very heavy resistance southwest of the town of Huertgen. West of Schmidt enemy pockets are being mopped up. The New York Times, Friday, November 10, 1944. Inside Germany, an indecisive struggle raged on in rain and sleet in the Hurtgen forest area southeast of Aachen. Here infantry of the United States 1st Army made a 600-yard advance just southwest of the Town of Hurtgen and held it in the face of counter-blows, but a similar advance to the south later was lost. West of Schmidt, 15 miles southeast of Aachen, American troops moved 300 yards across a snowy battlefield, slowly cleaning out pillboxes. Positions remained unchanged at Vossenack, two miles to the northwest, where Americans holding the town ignored a German ultimatum to surrender which was delivered by loudspeaker. Globe and Mail Nov, 11 1944. Bitter fighting continues in the Huertgen area and our units made local gains against heavy resistance west of Schmidt and are in the area southwest of the town of Huertgen. In Vossenack our units consolidated and improved their positions. The New York Times, Saturday, November 11, 1944. In the Huertgen area our units continued their attack against heavy resistance from dug-in enemy positions. Many mines are being encountered. A counter-attack was repulsed in this sector. West of Schmidt we have made progress and are clearing pillboxes. The New York Times, Sunday, November 12, 1944. The 2nd Ranger Battalion relieve elements of the 112th Infantry of the 28th Division in the Germeter-Vossenack area. As such the Rangers (approximately 500 strong) become the sole reserve reserve of the 28th Infantry Division. See-saw fighting still raged in the German forest of Hurtgen, southeast of Aachen, where the enemy drove the Americans back yesterday only to lose all gains to a counter-blow. Globe and Mail Nov, 14 1944. Operation “Queen,” the American assault on the ground and in the air begins with the heavy bombardment of the villages in the county. This is the beginning of the biggest air assault of World War II. For over ninety minutes, 2,400 medium and heavy bombers pass over the front lines to bomb the strategic targets of Eschweiler, Düren, & Jülich". The American soldiers try to break through to the rivers Rur and Rhein. The 8th Infantry Division begins moving to the southeast of the German city of Aachen in relief of the battered 28th Infantry Division. The 112th. Infantry and the entire 28th Division is pulled out of the line, having suffered thousands of casualties. By this time, Schmidt is now recapured and occupied by the Germans, which was a blow to the Allied command, as the high elevation of Schmidt enabled the Germans to dominate the immediate region with miles of visibility for artillery spotting. The 8th Infantry Division begins its attack against German defenses in the Huertgen Forest. First Allied ships unloaded at Antwerp. There was no confirmation of a broadcast by the German DNB agency's report Saturday that Allied troops have scored a seven-mile advance east of Aachen. If true this would place American forces on the east side of the Roer River. Infantry of the United States 1st Army had fought out of the depths of Hurtgen Forest, scene of the most sanguinary fighting on the Western front, but the northeast corner, five miles long and three miles wide, still had to be cleared before they hit the plain. "We definitely are not out of the forest," a staff officer on the 1st Army front said tonight, "and the Germans are fighting stubbornly with no indication yet of any collapse." Weisweiler, 13 miles inside Germany and 26 miles west of Cologne on the Rhine, fell to the American infantry after three days of mauling, house-to-house combat. Even before its fall, one armored force by-passed it in wheeling around to the south and cutting the highway leading seven miles east to Duren. The important height nearest to Duren is just north of Grosshau, five miles southwest of the Roer bastion, and to reach it, infantry had to fight across terrain where the Germans had fortified every house and connected them with trenches which were improved versions of those of the first Great War. Perhaps none of the day's gains was more important nor hard-won than those on the 1st Army front, where the attacking infantry hammered deeper into the enemy's Roer River line with advances of up to a half mile against stoutly-held positions. The 1st Army staff officer said that despite the bitterness of the fighting the great battle of the Rhine had yet to be fought. The Germans were believed holding back reserves somewhere west of the Rhine ready to be flung into the struggle. Still to be overcome are the formidable field fortifications which have made progress costly since the Allies first broke into Germany. The type of trench system encountered before Grosshau extends all the way back to Duren. When the infantry break out of Hurtgen Forest and drive into more manoeuvrable country where tanks will be able to give them close support, the Germans may choose to commit the bulk of their armor, and the great battle for the Rhine will be joined. Globe and Mail Nov, 27, 1944. Our forces north of Huertgen are within a few hundred yards of Grosshau and Huertgen itself is under fire from our artillery. Strong points and transportation targets in. the area north of Dueren were attacked. Fighter-bombers attacked a number of pillboxes and gun positions in this area. The New York Times, Monday, November 27, 1944. The German city of Hürtgen is captured by forces of the 8th Infantry Division. The next day the Americans capture Kleinhau and Großhau. United States 1st Army infantry to the south fought into the centre of Langcrwehe, 14 miles inside Germany and the last major road centre west of the Roer, four miles past. Eight miles south they seized most of the forest anchor town of Hurtgen, 2 1/2 miles from the river. Five miles southwest of Duren they fought into Grosshau, which earlier was plastered by artillery. Like the 9th, the 1st was fighting the bitterest kind of opposition over a battlefield turned into a quagmire by rain and snow. Globe and Mail Nov, 28, 1944. Unites States 1st Army infantry won the fortified towns of Lamersdorf and Grosshau in savage fighting and put most of the bloody Hurtgen Forest behind them. Globe and Mail Dec, 1, 1944. In the Dueren-Huertgen sector our ground forces repulsed counter-attacks at Inden and Lamersdorf, and fighting continues for both towns. Langerwehe was cleared. Gains were made in attacks in the Merode area west of Dueren. Farther south, our forces continued to push out of the Huertgen Forest. Kleinhau and Huertgen were captured. The New York Times, Friday, December 1, 1944. US 5th Armored Division occupies Brandenberg. Brandenberg was taken by tanks and infantry which pushed through the village to within a quarter of a mile of Bergstein, 1,000 yards to the east. One hundred and fifty Germans surrendered in Brandenberg after being cut off. Bergstein was bombed and strafed three times today by Thunderbolts. Pilots reported not a single building in the village intact by late afternoon. Globe and Mail Dec, 3, 1944. 27 Lancasters and 3 Mosquitos of RAF No 8 Group carried out the first of several raids on the large reservoir dam at Urft in the Eifel. The destruction of which was required so that the Germans could not release water to flood areas through which American troops wished to advance. The series of raids did blast 13ft off the top of the dam but no large breach was ever made and the Germans were able to release large quantities of water whenever they wished to interfere with American advances being attempted further downstream. Elements of the 28th Infantry Regiment, 8th Infantry Division, continue attacking the southeast and east from Brandenberg. The 1st and 2nd Battalions, reinforced by elements of Combat Command R and the 709th Tank Battalion of the 28th make slight advances. Other fortified villages in the arra of Duren were bombed and strafed by fighter-bombers of the 9th Air Force which flew about 300 sorties, most of them in support of the 1st and 9th Armies. Heavy fighting continues around the village of Gey, where the Americans have won their way onto high ground dominating the village. Globe and Mail Dec, 4, 1944. The Germans lose their last stronghold at Vossenack. 56 Lancasters of RAF No 3 Group attempted to bomb the Schwammenauel Dam on the River Roer to help the American Army, but the target was covered by cloud and only 2 aircraft bombed. No aircraft were lost. The 2nd Rangers capture Bergstein, with its controlling castle hill (Hill 400). ... we made gains against strong opposition and captured Bergstein, southeast of Huertgen. The New York Times, Thursday, December 7, 1944. Southeast of Huertgen we have made small gains to the east, south and southwest of Bergstein. Our units north of the town made little progress against stiff resistance. The New York Times, Saturday, December 9, 1944. Enemy attempts to regain Hill 400 east of Bergstein have been repulsed. The New York Times, Monday, December 11, 1944. The villages Gey and Strass are taken and the road to Düren lies open. The 1st Army's new attack was launched from the vicinity of Lammersdorf. By mid-afternoon Lt.-Gen. Courtney H. Hodges' troops had cleared the Villages of Rollesbroich, Bickerath and Simmerath, the latter a sizable road junction two miles southeast of Lammersdorf. Globe and Mail Dec, 14, 1944. In the fighting south of the Hurtgen Forest, the Germans were making a determined stand to keep the Americans off high ground northeast of Rollesbroich, while to the south, in the area east of Monschau, roadblocks, minefields and barbed wire slowed the advance. While the 1st Army there had the advantage of being on both sides of the Roer, the terrain is wooded and hilly, and tributaries of the Roer are difficult obstacles. Between that sector and Duren, infantry and armored forces, after clearing Gey and Strass, extended their holdings in an area about a half-mile east of Gey, which is four miles south of Duren. Infantry were slowed to a slugging, foot by foot advance, however, around Bergstein and Vossenack, seven and nine miles south of Duren, a front despatch said. Globe and Mail Dec, 15, 1944. In the Juelich-Düren sector Allied troops, alter overcoming heavy resistance, bare cleared Schophoven. The villages of Mariaweiler and Derichsweiler, west of Düren, and Gey, farther south, are also in our hands. Gains have been made in the areas north and south of Monschau. East and southeast of Roetgen our troops have taken Rollesbroich and Simmerath. Progress has been made in the forest area about four miles southeast of Monschau. The New York Times, Friday, December 15, 1944. The great German offensive in the Ardennes started on this day, with the object of capturing Brussels and the port of Antwerp and splitting the Allied armies into two parts(Battle of the Bulge). December until February 1945: The 104th US Division and 8th US Division are stationed in the Düren area as occupation forces. The Ardennes offensive is now the most important battle scenario on the western front. Nine miles southwest of Duren in the Vossenack sector strong enemy patrols succeeded in regaining some ground with infiltration tactics. The 1st Army took 647 prisoners Thursday, making its total 12,411 since the offensive began Nov. 16 and 213,511 since D-Day. Globe and Mail Dec, 16, 1944. At the Roer, west and southwest of Dueren, German formations engaged in heavy defensive fighting against strong infantry and tank forces of the American First Army, which again has been attacking on a broad front since yesterday noon. Fierce fighting continued until night and flared up again this morning. At tbe eastern fringes of the forest south of Dueren the attackers gained only a narrow stretch of bogged, crater-studded terrain, in so far as they were not thrown back to their initial positions by immediate counter-attacks. In the areas southeast of Roetgen fighting is in progress for several villages on the German front. The New York Times, Saturday, December 16, 1944. ... the 1st drove three miles east of Monschau in Germany and crossed the narrow upper reaches of the Roer. Further north the Roer remains a formidable barrier. The United States infantry advance was supported by tanks, and German artillery fire was noticeably lacking. The only spot of stiff resistance in the area was around Kesternich which fell to infantry on the 78th Division who also took Huppenbroich in hard fighting late today. The 78th Division had a battalion cut off in the town during the Germans Ardennes break-through and had been fighting in and around that point for more then a month. Heavy fighting was reported in progress against cut-off enemy troops tonight for the Town of Imgenbroich. Globe and Mail Feb, 1, 1945. American soldiers attack into the Huertgen Forest for the final time. While the eastward push of the United States 1st Army, now entirely inside Germany, further north was slowed, a gain of nearly two miles northeastward was threatening the system of five dams by which the Germans control the water level of the Roer, main barrier to the Cologne plain. Vanguards of the 78th Infantry Division, 17 miles southeast of Aachen, were battling up the west bank of the Roer, and were about two miles from the largest of the dams. Globe and Mail Feb, 6, 1945. The ruins of Kommerscheidt and Schmidt fall back in American hands. The Schwammenauel dam is finally secured. Nevertheless, with the threat posed by the dams ended, the First Army had finally finished its protracted ordeal in the Huertgen Forest. Feb. 11 (AP). - The Roer River ran as much as seven feet above normal today, and was two miles wide at one point as a result of the Germans' opening of the control valves at the Schwammenauel and Urft dams. The five-mile-long reservoir behind the Schwammenaul Dam went down 20 feet in 24 hours. The waters flowed north along the United States 9th Army front at from five to seven miles an hour. A flight in an artillery observation plane showed miles of inundated fields, forests and battered German houses along the whole northern sector of the Western front. Globe and Mail Feb, 12, 1945. Our forces have cleared the enemy from the area north and west of the Roer River between the Schwammenauel Dam and Heimbach. The New York Times, Tuesday, February, 13, 1945. Operation “Alligator.” The allied attack at Cologne, across the Rur. Several bridgeheads between Linnich and Düren.